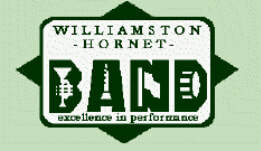 The Williamston Band program is part of the Williamston Community Schools in Williamston, Michigan. The program has a rich history of great leaders, students, and musicians. Students begin instruction in 6th grade at the middle school with classes meeting every day for sixty minutes. The 6th grade band gives 3-4 performances a year and students have the opportunity to participate in a solo recital night at the end of the year. The instruction continues in 7th and 8th grade where the students continue to meet five days a week. These older students have the opportunity to participate in the MSBOA (Michigan State Band and Orchestra Association) solo and ensemble festivals, district band festivals and can audition to be in the Michigan all-state band. These students give 5-6 performances a year, have the opportunity to join the middle school jazz band, and are challenged to perform high level music to prepare them for high school band. Once in high school, students participate in marching band for the first two/three months of the school year. The marching band performs at the high school home football games on Friday evenings throughout the fall. In addition, the ensemble participates in two marching band exhibitions, the Chelsea Marching Band Exhibition and the Grand Ledge Marching Band Exhibition. The marching band also performs in three parades through the year. After marching band season, students then switch to participating in the Symphony Band. This ensemble meets every day and performs at a number of events throughout the year. The group gives an average of 5-6 performances a year. Like the 7th and 8th grade bands, this group participates in the MSBOA district and state band festivals, including solo and ensemble festivals, band festivals and jazz band festivals. In high school, students have the opportunity to take more auditions on an individual basis and join ensembles throughout the area. In the past, students have participated in the Michigan all-state band, Spartan Youth Wind Symphony, Mid-Michigan Youth Symphony, as well as a number of honors bands at local universities. At Williamston, high school students may join one of two jazz bands that meet before school, can perform in the pit orchestras for the theater productions, and have other opportunities to collaborate and play in the community.